Our first poll ended. 50% of people thought it was a bearish week and 50% said otherwise. 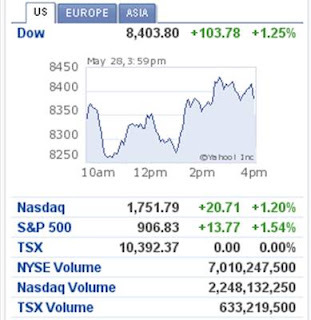 It turned out that Dow was up +2.7% and TSX was up +3.77%. GM is filing for brankruptcy on Monday. More layoff is coming. The market spit out most of the gain from yesterday. 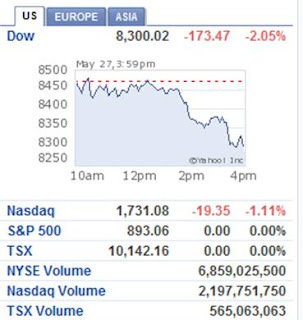 S&P500 dropped 17.27 points. Investors are cashing out and they are cautious, in my opinion. The National Association of Realtors reported April home sale data. Home sales were up 2.9% in April compared to last month. Inventories will take 10.2 months to deplete, which is very long. 45% of the sale in April was destressed sale or foreclosures. You can read more about home sale data from the New York Times here. Jim Cramer once predicted that housing market will bottom out in June09. I don't see how that is going to happen. HK market is closed for holiday. It jumped 893.71 pts yesterday. Is the bull really running? Analysts say that hot money is flowing into Asia. World economy is too interconnected. No any money will flow in one direction. 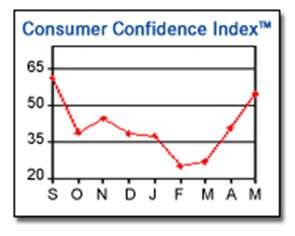 Consumer confidence index is at 54.9, up from 40.8 in April. This mainly drove the stocks up today. Some people believe the recession is easing. However, home prices in 20 representative US cities dropped 18.7% this march compared to last March (See detail here). Foreclosures are up too. 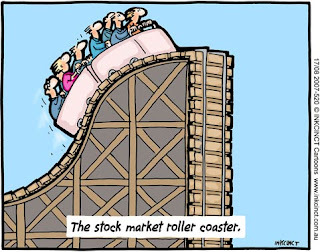 General Motors (GM), on the brink of bankruptcy, was riding roller coaster. 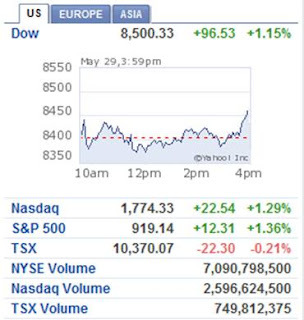 It went from day low (about -15%) to day high (about +8%). I am still bearish. Unemployment is still high and possibly will get higher. Foreclosures from prime mortgages are increasing. On the Canadian side, people claiming unemployment insurance has increased about 10% for the month of March. 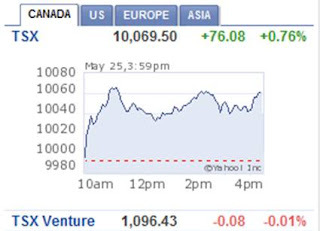 The US market is closed for Memorial Day. The Toronto market is up 76 points. 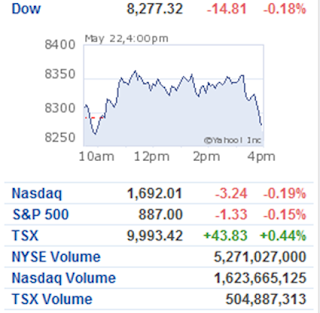 Royal Bank of Canada (RY.TO) is up 0.95% at $42.65 CAD. I like RY.TO because it's yielding at 4.73%, which is better than your interest from your saving account. Rumor says it may cut its yield though. We'll see this Friday. This week has a few important data to watch. The past Monday, NY market was up and then the rest of the week trailed off to an overall of 0.5% gain. 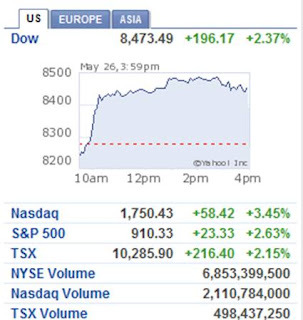 Toronto market was doing quite well this week, up by 2.36% for the week. Toronto market is always led up by oil and materials because they make up a big percentage of the index. I have to admit that I place my research effort on NY market market more then then Toronto market because my favorite stocks are listed on NY market only. Not too much news this week in NY. Even though Home Depot and Lowe's reported optimistic quarter results and outlook, it does not mean that the housing industry recovers. Home Depot did very well on cost cutting. They reduce the use of energy in their store significantly. Housing industry remains weak with housing starts was reported at record low. Hello all. I have been debating on whether I should have a new blog on stock market or my investments. I didn't want to do it initially because it's time consuming. However, it is a nice way to keep track of my own thinking and analysis of the market. Trading stocks is my second job and my hobby. It's exciting to watch the market moves. It's satisfying to have correctly predicted how the market moves. Since I still have my main job, I need to focus during the day. I have a plan. I use about 1 hour per night to read news and research. I call that my homework. I then decide on my moves, if there is any, for the next day. I don't care about the market movement or news during the day, unless I am bored to death. For the past few days, I've been bearish on the market. I haven't traded at all. I am waiting. I missed the March low because I was working on a few stupid manuscripts that were so terrible that my brain stopped working, almost. I believe there is still chance that the market comes down more. Economy is still bad. Job loss is still bad.